How has legal education evolved, and what unique challenges do today’s law students face? In this episode of On Balance, hosts JoAnn Hathaway and Tish Vincent talk to Victoria Vuletich about what the law school experience is like for the current generation of students. They discuss a broad scope of current law school issues including: restructuring trends in the legal profession, technology advancements, shifting student learning styles, and increased support of student mental health. Victoria Vuletich is the assistant dean at the Grand Rapids, MI campus of Western Michigan University Cooley Law School. Intro: Welcome to State Bar of Michigan’s On Balance Podcast, where we talk about practice management and lawyer wellness for a thriving law practice with your hosts JoAnn Hathaway and Tish Vincent, here on Legal Talk Network. JoAnn Hathaway: And I am JoAnn Hathaway. We are very pleased to have Victoria Vuletich, Assistant Dean at Western Michigan University Cooley Law School join us today as our podcast guest to talk about the 2019 Law School Experience. So, Victoria, would you share some information about yourself with our listeners? Victoria Vuletich: Thank you for having me today. I’m really excited to be talking with you. I have been in the legal profession most of my career. I’d started out as a court clerk, became a paralegal, and then went to law school, and after graduating from law school I practiced privately for about six years in a Main Street law firm in Owosso, Michigan, and then after that spent 10 years as I’m in-house ethics counsel at the State Bar of Michigan where I got to work with you, JoAnn, and for the last 10 and-a-half years have been teaching Professional Responsibility and Evidence at the Grand Rapids Michigan campus of Thomas M. — Western Michigan University Thomas M. Cooley Law School. Tish Vincent: Thank you, thank you, that’s quite a résumé. And so with all that experience with legal education both as a consumer and as a professor, can you share with us some of the changes you’ve seen in legal education? Victoria Vuletich: It’s been very striking how legal education has changed and some of that is market-driven which we can talk about a little later, but in terms of the classroom and the student experience there are several dynamics that have really driven reform as it’s termed in legal education, and the first and foremost cause of that is that learners have changed over the generations, and I remember when I was a kid, and you may remember the annual field trip to the museum that you took when you were in school and we’d go to the Museum of Natural History and there would be the stuffed antelope and there would be the stuffed polar bear, and eight years later when my younger brother would go to the Natural History Museum, the same antelope was there and the same polar bear was there, and that has really changed. If you go to museums today, particularly children’s museums, and it is a very hands-on interactive experience. Learners today, young learners today are used to very interactive hands-on experiential way of learning, and yet modern legal education has been very slow at recognizing that and we throw them into classrooms, up until very recently have still followed the Professor Kingsfield Paper Chase Model where they are in a classroom and a professor randomly calls on them and engages in the Socratic method with them, which can be terrifying and intimidating and highly analytical. And so it’s a situation that’s very foreign to many of our young learners today. There’s just no question that the digital revolution has changed the way learners learn material and that has had several consequences, that’s to be entertained while learning things. You say, I’m going to date myself, but I remember when MTV first came out and it was just such a revolution and my brothers and sisters and I would watch the same 25 videos over and over, because it was such a new thing. And this is — our new learners today are very visual, they acquire information at a fast pace and may expect their world is one of entertainment not just an acquisition of knowledge and the flipside of that coin, I mean that’s a wonderful coin, the ability to obtain information so quickly compared to even 20-25 years ago. The flipside of that coin is its impact on focus, and I can personally attest to how having access to the Internet and cell phones and multiple devices has negatively impacted my ability to focus. And so law school and law study requires a lot of sustained focus, that is foreign I think for a good percentage of law students today. And the other thing that I would add to that that is related is that they think that there’s a generational impatience with the learning process, because younger people are able to access information so quickly, and in such a concrete fashion they perhaps have an expectation that the learning process is more of a downloadable experience. And those of us who are a little older know that learning particularly deep learning is something that comes overtime and slowly and most often you learn by doing it wrong, you’re getting it wrong, of where you start to get it right it comes with much practice. So they are more impatient I think and our generation was with that learning process. JoAnn Hathaway: So Victoria, how do you see law school students experience anxiety today? Victoria Vuletich: My goodness, that is a topic that we could talk about all day. Millennials have I think unfairly been tagged with the label of being lazy, and one of the things that I and my colleagues have discovered is that there is an epidemic of anxiety in our society to — not just young people, but it does manifest in law students in a way that I think is a little different than the way anxiety manifested in other generations of law students. And we see very bright, very capable students who when faced with anxiety one of their reactions is instead of fighting and working through this and recognizing that they are anxious about something and learning how to manage that, they flee the fight-or-flight mode, and the way they flee is by not engaging. And so, they will consciously or subconsciously just not put their best foot forward so that they already have a reason to peg if they underperformed. Well, I stayed up too late or I didn’t put the time into it, so it’s almost a form of subconscious self-sabotage, because in my non-trained psychological opinion it seems that it’s too painful. It feels too painful and too risky to put themselves totally into something and at the risk of failing at it. And so we — and of course in the law school experience in becoming lawyers that’s a very pernicious dynamic that has to be addressed. They’re not going to be able to achieve their goals of doing well in law school and being a good lawyer if they can’t recognize and manage their anxiety and learn how to face it. Tish Vincent: So in attempt to avoid their anxiety by avoiding the legal learning and the legal tasks is going to harm their potential for success in this field. Victoria Vuletich: Very well said. Thank you. I was speaking in your area of expertise, Tish. Tish Vincent: Yeah. You are doing a great job. Can you say a little bit about a challenge you see to today’s law school students from the underfunding of public education? Victoria Vuletich: Yes, that’s another factor that, not just law schools, but undergrad institutions are facing. We already know that learners coming out of wealthy well-funded school district versus an intercity school district are going to have acquired stronger and better learning skills perhaps than the other, but by the time they get to law school the two things that we are really seeing. Number one, weak writing skills and that is really critical because as an attorney being able to write well is a crucial skill. That’s how you speak predominantly to the court, writing and reading, whether it’s your case law or statutes is imperative. And the other skill that we find being very weak are analytical skills, and I don’t think it’s any accident that both writing and analytical skills take a lot of time and personal attention to develop in students. In order to become a good writer and in order to acquire strong analytical skills, that requires a lot of process, a lot of time, and attention from the teacher. And if your public education experience when you were younger didn’t give you a lot of that, you are going to be at a disadvantage by the time you reach college and particularly law school. JoAnn Hathaway: I have heard you say that law school students today are seeking a deeper meaning. Can you share more about that Victoria? Victoria Vuletich: Yes, and this is one of my favorite things about Millennials, and as I said earlier, sometimes they get a bad rap and I think all generations get knocked by the prior generation. But one of the really wonderful things that I love about Millennials is that they really want to effectuate positive change. They want to make the world a better place to be and they want to know that what they are learning is important to the world. And I have only recently come to realize the challenge that that poses to teachers, because as teachers, particularly law teachers, we forget how much context we already have. We have been through the practice of law, we know how a court case works, we have that bigger picture. So I had a student in my office last term and we were going over the rules of character evidence, which are particularly complex and difficult to master and we were focusing on the very technical elements of those rules and the process and how they interplay, and she was so frustrated, because she said, I don’t understand how these matter. I don’t understand why these rule elements — what they mean and why they are important. And it suddenly dawned on me that I have to do a better job of indicating to them that these rule elements will control what sort of evidence gets in to a case and what sort of evidence stays out of a case, and that can determine whether an innocent person goes to prison or keeps their freedom. So they really need that context and meaning in order to do that deep technical digging into the rules and the case law that have been perhaps intuitive for other generations. Tish Vincent: That’s very interesting. How have you seen the legal profession restructure in the last decade and what is the impact of that on law schools and students? Victoria Vuletich: Well, that’s a really interesting question. The way I characterize it is that 2008 was a perfect storm. First of all, you had the Great Recession of 2008, which restructured many things in our society. You combine that with the rise of technology and you see how technology has disrupted all sorts of industries. You look at what Uber did to the taxicab industry, what Airbnb has done to the hotel industry. And the law profession, the legal profession is no different. Consumers now have the ability to obtain legal documents online much more conveniently and perhaps much more cheaply than they could in the past. And the third factor coming in are the new generation of learners and how they learn very differently than other generations of learners. So that has completely upended legal education, because the old method of law school was a cash cow. You could put 110 people into a classroom with one professor and there were enough applicants, there were enough people interested in going to law school that you could make it a sink or swim model, where you just threw law students in and those who were able to figure out how to swim got to stay in the pool and those who couldn’t figure out how to swim on their own didn’t get to stay in the pool. Well, that no longer works, not only because the pool of learners demographically, they are just not as many potential students in terms of raw numbers out there for schools. The old teaching methods don’t work for the generations of learners that we do have. And I am not even sure that old Professor Kingsfield model worked very well for us. And so what has happened is post-2008 law school enrollment is down across the board for all law schools, and that means most law schools are chasing the same students, and so it’s highly competitive, and because of all of the changes and the change in how the new generation of learners learn, you need smaller classes and more teachers at a time when enrollment is down now. So the restructuring of the legal professions has really put pressure on the law school business model, which has also put pressure on the law school learning model at the same time. So if you talk to law schools and you explore law schools, it’s very interesting to see how law schools are responding to these changes and reforming their curriculum and reforming their business models to address these dynamics. JoAnn Hathaway: Victoria, do you have any thoughts about the pluses and minuses of the bar exam in general? Victoria Vuletich: Well, that is certainly the last piece and it’s a very important piece, the process of becoming a lawyer, and there absolutely has to be a competency threshold. The legal profession and law schools owe it to the public to ensure that we are turning out good, ethical, strong lawyers. However, the one piece of the legal education process that has not been reformed, that is not changing and responding quickly to the very significant dynamics occurring in the restructuring of the legal profession and the restructuring of the economy is the bar exam. Essentially the bar exam is the same format and the same process that I went through 25 years ago, even though the world is a very different place. The traditional bar exam stresses theoretical technical knowledge, but it doesn’t test problem solving skills, and just because you have a lot of technical legal knowledge doesn’t necessarily mean you are going to be a great lawyer. And if I may share a quick story, there is a law student I know, very gifted, his dream was to be a prosecutor and he was very skilled on his externship in a prosecutor’s office. There were jobs awaiting him once he graduated and passed the bar. He was just born to be a prosecutor. And he struggled to get past the bar exam and his issue too was anxiety. Even though he was very smart and he knew the law, very talented lawyer, the bar exam was very difficult for him, very anxiety provoking process. And I very much respect and admire him because I think he sat for the bar exam for six, seven tries and he finally passed it and immediately upon passing was given a job in a prosecutor’s office, because everybody recognized what a talented prosecutor he is and I am thrilled that his dream is fulfilled. And the real key to that story is that one of his loves as a prosecutor was working in the juvenile division of the court, because he didn’t view his role as a technical lawyer, prosecutor. He really wanted to engage in reform. He wanted to give this juvenile offender a chance to redeem his or her life, to make this young person’s life different and to make it better. And I shudder to think if he hadn’t had the perseverance to keep going, how many people like him are we weeding out of the legal profession with the bar exam. And the bar exam, as its structured now, is easy and it’s measurable, but I really question whether it’s measuring the key skills and I am not alone in that opinion. Recently the American Bar Association Council on Legal Education has proposed a significant change in the standards by which law schools would have to adhere to that would significantly impact access schools, schools who really believe in diversity and inclusion and have a broad front door and a smaller back door, so to speak. It was resoundingly voted down by the ABA House of Delegates in February and I believe it’s for this reason that the practicing bar, the legal profession recognizes that law schools are working to change their business models, they are working to change those academic models. And the one piece that hasn’t changed is the bar exam, and until the bar exam catches up with the changes that are occurring in the legal profession and legal education, it won’t be an accurate and fair assessment of who should and shouldn’t be lawyers. JoAnn Hathaway: Well, Victoria, it looks like we have come to the end of our show. We would like to thank our guest today, Victoria Vuletich, for a wonderful program. Tish Vincent: Victoria, if our guests would like to follow up with you, how can they reach you? Victoria Vuletich: Sure. My email address is [email protected]. They can reach me through the Cooley website, www.cooley.edu and I am also on LinkedIn. Thank you very much for talking with me today. I have a lot of passion for the subject. It’s really wonderful talking with you about it. Tish Vincent: Thank you Victoria. It’s been wonderful hearing your thoughts on these important issues. 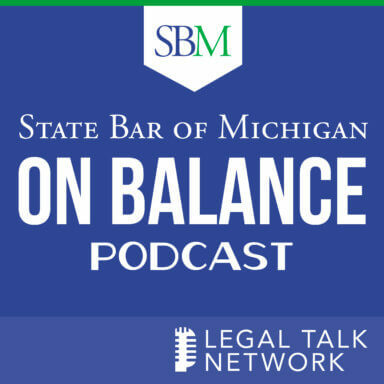 This has been another edition of the State Bar of Michigan: On Balance Podcast. JoAnn Hathaway: I am JoAnn Hathaway. Tish Vincent: And I am Tish Vincent. Until next time, thank you for listening. Outro: Thank you for listening to the State Bar of Michigan: On Balance Podcast, brought to you by the State Bar of Michigan and produced by the broadcast professionals at Legal Talk Network.